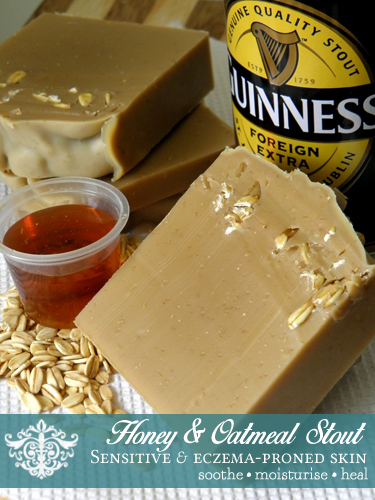 Made with Guinness stout, local wild honey topped off with ground & whole oats and kukui nut oil! Suitable for all types of skin, even sensitive skin. Contents | Extra Virgin Olive Oil (Olea europaea), Coconut Oil (Cocos nucifera), Shea Butter (Butyrospermum parkii), Honey & Stout, Sodium Hydroxide, Castor Oil (Ricinus communis)(*), Apricot Kernel Oil (Prunus armeniaca), Kukui Nut Oil (Aleurites moluccana), Ground and Whole Oats(*), Rosemary Oleoresin, Vitamin E.
Guinness stout is made primarily from barley, hops and brewer’s yeast, making it jam packed with natural vitamins and minerals. The healing properties of these ingredients also makes a versatile soap that you can use from head to toe. Barley contains minerals that preserve the skins elasticity and protect it from free radical damage. Hops have a relaxing effect on the body, are skin soothing and have natural anti-septic, anti-bacterial and anti-inflammatory properties. Brewer’s yeast kills the bacteria associated with acne. Shea butter comes from West and Central Africa and has long been used in cosmetics and beauty products – modern and traditional. Traditionally, African healers and beauties use this butter for a variety of skin and hair treatments. Shea butter is rich in essential fatty acids and natural antioxidant compounds that promote cell regeneration and growth. It also contains natural sun-protection qualities. Note that shea butter comes from a nut and thus is not suitable for anyone with tree nut allergies. A natural exfoliant, oats (and oat milk) soothes and heals skin while reducing inflammation making it suitable for sensitive skin or skin prone to irritation. High in silica and well-balanced in amino acids, oats are a great emollient. Oats have actually been clinically shown to help heal dry, itchy skin and is one of the more common ingredients used in treating eczema. Ancient Greeks and Romans use oat baths (oats and water = oat milk) to heal skin ailments. Honey is a humectant and makes for a great moisturiser, aiding in skin hydration. It also contains antibacterial properties and is taunted to be a great anti-aging agent due to its high content of nutrients, antioxidants and vitamins. Kukui oil is used to treat a variety of skin ailments such as eczema, psoriasis and burned or damaged skin and makes an excellent botanical source of fatty acids and antioxidants, as well as Vitamins A,C and E.